The 26-year-old German violinist Veronika Eberle, making her Utah Symphony debut this weekend, possesses a beautiful tone that is round, sonorous and rich in overtones. 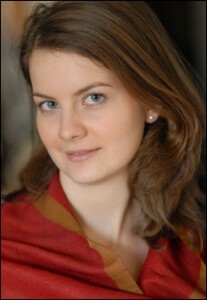 With Shostakovich’s First Violin Concerto as her debut vehicle Eberle was able to show off her remarkably lyrical side. One of the composer’s most melodic works, the First gives the soloist the opportunity to explore her expressive side as few 20th century concertos do. In many ways it’s a throwback to the 19th century because of this aspect, yet it nevertheless is a work that belies the period in which Shostakovich wrote it (the 1940s). Not only is it lyrical, but the First is also intense in its expressions and charged with a profound emotional palette (after all, it is by Shostakovich). And Eberle certainly knew how to get the most out of it. Her account was thoughtful and well considered and did full justice to the intent of the score. Music director Thierry Fischer and the orchestra mirrored Eberle’s approach. Fischer elicited finely crafted and nuanced playing from his ensemble that was as sensitive and well intentioned as the soloist’s. This was an exceptional and first rate collaboration. Rounding out the program this weekend is Mahler’s Symphony No. 4, with popular local soprano Celena Shafer singing the final movement. Fischer captured the humor and charm of the work with his well conceived interpretation that embraced its quiet energy and flowing lines. The orchestra played with finely molded lyricism and expressiveness; and the many solo passages were well played, in particular concertmaster Ralph Matson’s extended solos in the second, Ländler-like, movement. In the closing movement Shafer embraced the wit and vivid imagery of the text with her usual flair and technical self assuredness. As a programmed encore, Shafer sang Richard Strauss’ lush and romantic song Morgen! with great feeling and tenderness. And Matson’s solo playing offered a delightful counterpoint to the vocal line. The NOVA Chamber Music Series has established itself as an organization that regularly supports the creation of new music written by the very best composers living and working in Utah. Sunday’s concert was no exception. The concert featured two works from University of Utah music professor John Costa alongside two from Arnold Schoenberg. These local collaborations are invaluable. By connecting the area’s top composers, performers, and arts and education institutions, NOVA is fostering growth within the local art music scene. The afternoon’s concert was a smashing success. Costa’s “Whiplash,” a three movement piece for violin and piano opened the concert in its world premiere. Immediately a crackling energy was established. Costa writes that “the music is direct in a rock-driven sense, capturing its essence but not resorting to imitation.” Some of that captured essence might lie in the driving rhythms and big, powerful piano chords often heard in the same register as those typically produced by the electric guitar in the rock genre. Violinist Hasse Borup and pianist Jason Hardink brought the necessary drive and forcefulness into their performances of the piece, but never at the expense of precision or expressive playing. The three other works on the program were all set to poems. The two Schoenberg pieces provided a nice contrast between the composer’s late romantic style, often compared to Wagner or Mahler, and his later innovations in 12 tone writing. Even if Schoenberg had never conceived of the act of abolishing a tonal center in his music he would still likely be remembered for the incredible quality of the tonal music he wrote in his youth. The “2 Gesange,” taken from his op. 1, is a good example. Written while the composer was still in his 20s, the work shows a strong command of the harmonic language of the highly chromatic romanticism of the time. Written for bass-baritone and piano, Hardink and guest artist Timothy Jones sounded lush and colorful. In the “Ode to Napoleon Buonaparte” Schoenberg’s mature style dominates. Written for piano with string quartet, the performance featured Jones reciting the Lord Byron poem of the same title. Jones, Hardink, and Borup were joined by violinist Hanah Stuart, violist Joel Gibbs, and cellist Noriko Kishi. Together, they delivered an intense and spirited reading of Schoenberg’s score. Costa’s “Refuge” closed the concert. Set to five excerpts from Terry Tempest Williams’ “Refuge — An Unnatural History of Family and Place,” the work finds Costa exploring Williams’ themes from a musical perspective. The text deals with issues of death within families, the terrible disease of cancer, and denial before breaking through to a brighter outlook toward a new horizon. Costa’s score very gracefully reinforced this emotional text. All of the afternoon’s performers took part in this final piece, closing the concert with a moment of transcendence, made possible by the fusion of music and text performed with passion and a high level of proficiency. NOVA should be commended for producing another wonderful season of concerts. Their programming has been a fascinating blend of time tested chamber music classics with new and exciting works by some of the most interesting composers of our time. Next season looks just as promising.